Join The Traveling Trio Fan Club by getting in touch at the email address below. If you're under 18 years of age, please get your parents to give you permission and help you join. You'll receive email updates about new episodes of The Traveling Trio and other Big Red Hat Productions shows. Your email address will be safe at all times and you will always be given a safe link to use if you decide to unsubscribe. We'd love to hear from you. Let us know what you think about the shows and we'll post your comments on the Reviews page. 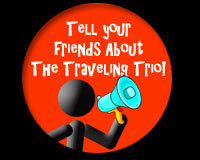 Send your comments to info@thetravelingtrio.tv.